This Wednesday, December 14th, is the last chance to make ourselves heard by the Delaware River Port Authority Board of Commissioners. Please join us if you can for a bike ride over the Ben Franklin Bridge to the DRPA Board meeting. We will meet at 8:00 AM at the South Walkway (5th Street entrance) in Philadelphia and plan to arrive on the Camden side at 8:30am. We will invite the press to meet us there. "I commute over the bridge frequently for shopping. It is almost impossible to roll a heavily laden bicycle up the little ramp built onto the side of the steps. It is very hard work pushing the bike up and the bicycle bags keep getting caught against the side of the railing. Because of this, I do not shop in Philadelphia as often as I would like." 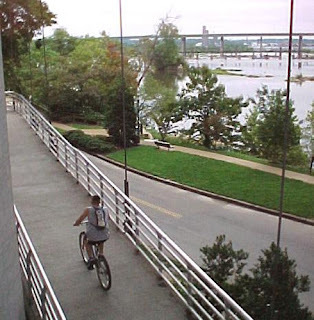 "[I] should not need to be a super hero to get a bike onto the walkway." "The ability to bicycle commute between the NJ and PA communities in our area is essential to the optimizing the health and fitness, well-being, and environmental surroundings of citizens. As with so many other projects like this, the expense of adding a ramp will only boost long-term economic activity in the area." The DRPA Board meeting is Wednesday, December 14th, at 9am. It is being held at 1 Port Center, 11th Floor, Camden, NJ (directions). A better way to the top.